When you say the words chic cocktail soiree images of Truman Capote’s Breakfast at Tiffany’s comes to mind. Guests are decked in elegant clothing and excellent taste is reflected in everything from background music to the glasses that the drinks are served in. That is a lot of attention to detail. Find out how to get this mix of essential ingredients just right. The first task is to decide on the date and time for the party. Make it an evening event. Your guests are likely to be winding down from a day at work and are more likely to be in the mood to party.The window for a cocktail party is generally between 6pm and 10pm – although if the party is in full swing, there is no need to cut it off at that time – provided that your neighbour’s are still happy! Generally, people love to dress up. Some of us rarely get an opportunity to don the glad rags and enjoy a special evening out in our finery. A sophisticated dress code goes a long way to create the right mood. Guests will also feel on their best behaviour when they are dressed smartly. Make sure that the invitation you send, whether by text, email or post, specifies what the dress code is going to be. Black tie and little black dresses might be an ideal choice – who doesn’t have a black dress or a suit lurking in their wardrobes? Would you like the good news? Eight course meals are not required. Cocktail parties are not the right medium to advertise your gourmet cooking ability. Hors d’oeurves and small portions of easily eaten food however, are the order of the day. To really raise the level of sophistication at your party you need to go beyond crisps and bowls of salted nuts. The offerings should be small quantities of top quality and indulgent food. Assuming that you have not invited any gluttons, allow five to ten bites per person. This should ensure that each guest gets a fair share. The canapés should be a mixture of sweet and savoury and hot and cold. Here are some ideas that you might like to adopt for your party – remember to do as much as you can in advance of the evening. After all, you are meant to enjoy a party! It may sound ridiculously indulgent and expensive but you don’t have to get the finest beluga for your party – a supermarket bought fish roe will do. Simply cut pieces of toast into small one inch squares and place a small amount of caviar on top and serve. Get a packet of nori from your supermarket or health shop. Place assorted ingredients on each sheet. Cooked sushi rice with cucumber or pieces of sliced smoked tofu on one with grated carrots and avocado on the other. Roll each sheet and cut into pieces. The preparation here is minimal – buy some fresh oysters on the day of the party from your local fishmonger and serve on a tray with some lemon juice. Slice a pear into delicate slices and place a small amount of cheese on top. Stilton works particularly well. Garnish with a small piece of walnut and serve. If anything, the main attraction at a cocktail party is the cocktails themselves! 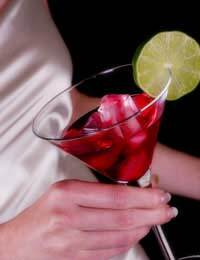 If you are confident mixologist then don’t be afraid to whip up an array of drinks for your guests. Alternatively you can always hire an expert to do that for you. There are a few practical things you should prepare for. Ice is a necessity to keep the drinks cold and have enough in stock. Room temperature drinks are never appreciated unless we are talking about red wine. Make sure that you have a variety of glasses on hand. It won’t do to serve martinis in half pint glasses at a party like this. Have a selection of white wine, red wine, champagne, martini and beer glasses to cater for all drink requirements. As a general rule there is one drink that is always well received – champagne. It is a sophisticated drink that also functions as a good base for a cocktail. For example, add raspberry liquer to it and a few raspberries on top and you have an attractive and sweet drink. Crème de cassis, poured slowly into half a glass of champagne creates the delicious and classic Kir Royale. The list goes on. You need Absolut citron vodka, half a teaspoon of dry vermouth, 1 lemon slice and 1 teaspoon of limoncello. Mix together and enjoy but be warned - this is quite a strong drink so control your guest’s intake of this one! You may have the drinks, nibbles and guest list covered but don’t forget the details. It is important to have seating available at whatever venue you decide to host the event in but get the balance right. You want the guests to circulate and having seating for everyone will allow them to get comfortable and stay in set social groupings. Have approximately 1 seat for every 2 guests. Keep the background music and the lights low. Bright lighting and loud music stifles conversation and everyone will be less likely to stay longer than half an hour. Keep it inoffensive. Candles and dimmer switches are a host’s friend. Couple that with low levels of music like jazz to relax your visitors and create a comfortable ambience. One last gem of a tip – smiles are contagious so as the host, smile and try to be relaxed. This feeling will spread through the party and everyone will have a much better night as a result.